It’s a cold, wintry, wet Melbourne day, but luckily I’m rendezvousing at warm, cosy Café Ab’stract in George Street, Hartwell. 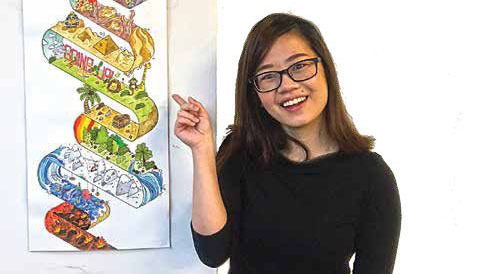 My coffee companion today is Eva Yap, freelance graphic designer, whose drawings have recently being showcased at the café under the title “little girl, big world”. Eva has just completed her Bachelor of Design at Swinburne, where she majored in communication design and minored in illustration. 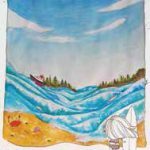 She is currently looking for work in a design studio or for individual projects, and has a strong interest in illustrating children’s books. Her drawings – in ink, watercolour and mixed media – display a verve for colour, a touch of humour, and a naivety that is enthusiastically embraced in the vision of the artist literally looking in. Eva has been in Australia for only a year. The series of drawings on display is imbued with a fascination for the Australian landscape. 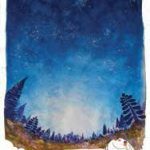 “What the artist sees” in Australia, she says, is unique, diverse, refreshing and inspirational. She has tried to capture not just the scenery, but also her delight and wonder, “how she feels”, when she contemplates the scenery. There’s “personality everywhere” in Australia, she says, and her artwork genuinely captures that view and also her own bubbly, enthusiastic outlook. Sorrento Beach was born of her experience as a participant in a beach program arranged by Swinburne for international students. 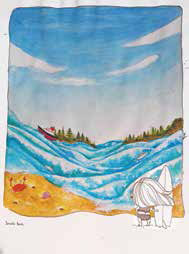 The artist here is seen as the line-drawn surfer looking into the artwork at a swirling, tumultuous, aquamarine-coloured sea, with little boats being tossed about. The image juxtaposes the power of the sea with the cartoon-like surfer and reminds us, even in its naivety, of the dangers of that powerful surf. Similarly, Little River captures the wonder of a starlit night in the country. 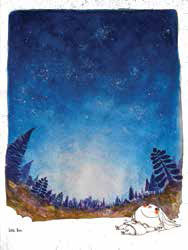 The line-drawn artist is seen lying down with a happy smile, gazing up into the colour and sparkle of the vast night sky depicted in the painting. Eva again capturing “how she feels” as, for the first time, she views the starry sky in Australia’s countryside and contemplates how small she is relative to the vastness of the universe. Another artwork, Going up (top of article), was a project Eva completed when she was asked to design a vinyl album cover. 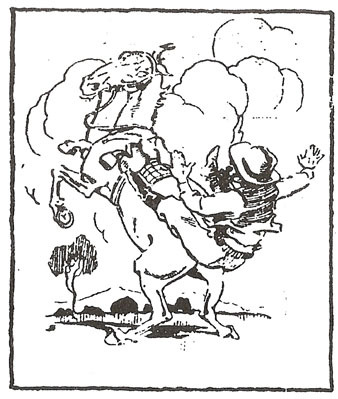 The resultant cover “translated” the theme of elevator music to that of the visual staircase of different worlds. A different elevator level, a different department store floor, a different outlook on life. Eva’s artwork was on show at Ab’stract on George until mid-August. In September another artist will be featured. If you’re after a good coffee, a cosy place to hunker down from Melbourne’s cold winter, and a touch of art, make sure you check out Ab’stract on George. Eva can be contacted via email: hope.love.faith.production@gmail.com ; her other works can be viewed at evaproduction and behance.com/evaproduction.